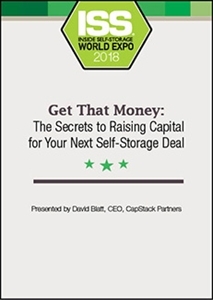 If you want to successfully raise capital for a self-storage project, it's crucial to understand different investor profiles, their deal structures and what gets them to say yes to a transaction. Our presenter will walk you through the investment landscape to help you succeed at fundraising. He’ll also explain how to identify qualified developers, a good location, the right cost basis, economic drivers and risk.